Roxborough State Park was established in 1975, but the land has been home to the heart of a caern for far longer. The exact date of the caern's creation has been lost, but it's possible that it has at least been a strong center of spiritual energies for hundreds of millions of years. Ancient red sandstone formations spike upward, tilted at angles that make it seem as though they are perpetually falling to the earth or lifting to the sky, yet never truly moving. Monoliths of granite date back to the Precambrian era. Though the Park is less than forty years old, somehow the more fragile sandstone formations and scrub woodlands have been remarkably well-preserved even before then. Hundreds of bird, insect, amphibian, and reptile species can be found within the park's borders. Deer, prairie dogs, and rabbits are common sights even on lowland trails. Black bears, coyote, elk, and fox keep to areas less frequented by human beings. At the base of the six different trails that run through Roxborough State Park is a Visitor's Center with two small parking lots, restrooms, a picnic area on a sun-drenched flagstone deck, and a few small exhibits about the flora, fauna, and rock formations within the park. There is a pair of vending machines and usually a clerk or two in dark green polo shirts who are available for questions, emergencies, hiking stick rentals, or souvenier purchases. Staff presence at Roxborough State Park seems minimal, and visitors often find themselves not even noticing they're there. Roxborough State Park is 3,339 acres (or 13.51 square kilometers). It connects to several other trail systems along the southern edge of the Denver area. The entirety of the park is a park of the caern's bawn. Its energies even spill outward a bit, past the delineated boundaries known to humankind. To enter Roxborough State Park, visitors drive past the Aurora Rampart Reservoir, through the village of Roxborough Park, and around the Arrowhead Golf Club. Passing a tiny fire department, the paved roads end and become dusty, dry roads without lanes or anything resembling a smooth ride. A day's park pass costs , and even then it's a several-minute drive before one can park at the visitor's center. By the time visitors have passed through the entry gate, the effects of entering the bawn have already begun. It becomes difficult to remember when one last came here. It becomes difficult to remember which trail one has already walked. The sense of being removed from the rest of the world and detached from its concerns grows, which most human beings attribute only to the pacifying serenity of being in nature. This sense of forgetfulness and timelessness grows the deeper one walks into Roxborough. Seeing other people walking the trails becomes almost startling; groups that did not set out together typically ignore one another even as they pass each other. Upon returning to the visitor's center and driving back to the gate to leave, people tend to feel as though no time at all has passed. Though they know they did more than drive up, look at the skyline, then turn to leave, it is hard to remember the details of their hike, their picnic, or any of their time there. 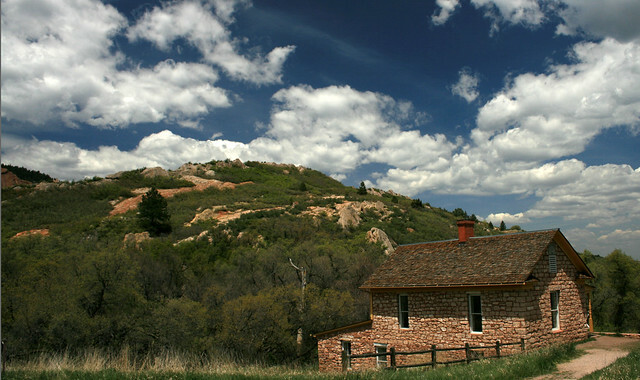 Almost all employees of Roxborough State Park are Kinfolk who live in the nearby village of Roxborough Park alongside normal human beings. They are the first line of defense for the caern, in many ways, and because they are rangers and clerks and janitors and so on, they often participate in patrols of the outer edges of the bawn. Further in, the Guardians and the Warder maintain spiritual lines of defense with the Master of Rites and very physical lines of defense with fang and claw. The Warder carries two fetishes of the sept: a Watchspear and a Sentry's Voice. The most pervasive defense the sept has, however, seems to come from the spirit of the caern itself and is known colloquially as 'Erosion'. This is the memory-altering effect the land has on humans, and even some Kin of younger age or lesser will. Even the eldest Garou in the sept do not fully understand Erosion, only that it is effective enough to have kept the caern safe from incursion for eons. The spirit of the caern is a powerful, enormous Earth elemental. Its physical body is every formation of sandstone and granite, every trail, every meadow. The earth elementals are said to be the Firstborn of Gaia, the foundation for all other spirits She birthed into existence. The caern spirit of the Sept of Forgotten Questions has a memory that goes back to a time before human and Garou. It even considers the struggles of the Triat to be just another fraction of an unfathomable history, and is only dimly concerned with the Apocalypse. As such, it is an incredibly stable and powerful totem, but it is also difficult to rouse to anger even when the Wyrm threatens its very heart. When a Garou seeks to join the Sept of Forgotten Questions, they are expected to offer chiminage to Earth. This is less a demand of the spirit and more a requirement of the sept. Garou are to go to the heart of the caern and tell it the story of their earliest memory, no matter how unclear. The content or impact of the story is unimportant; what matters to Earth is the sharing. It remembers everything. It even takes the memories of those who walk upon it, dimming them. Going back to the beginning of their own memories is a way for Garou to have commonality with Earth. They retain these memories, and sometimes, if they are lucky, Earth will share one of its own memories in return: the birth of a new tree, the digging of a rabbit's burrow, the shattering quakes that drove rock toward the sky in a time before history, the spilling of blood upon dust, the nipping of elk's teeth on grass. The location of the caern's heart is too narrow and difficult to reach to make a good place for assemblies Garou, so monthly moots and other gatherings are held in spots that range all over the bawn. One of the duties of the Caller of the Wyld is to choose the location of the moot and call the Garou to it. Whether the moot is to be held in the physical realm or the Penumbra is also up to the Caller of the Wyld, and whoever holds the role that month stands to gain -- or lose -- standing in the nation for their choices. Sometimes the Garou meet in between the Fountain Formations, with younger and lower-ranked wolves struggling to get to the front to be heard. Other nights the Garou gather in high-plains meadowlands, exposed to the moonlight and the elements. Another location occasionally used for informal meetings -- though never for moots -- is the Persse Homestead, found at the northern tip of the Fountain Valley trail. The two-story home is hardly isolated, and during the daylight hours is a popular spot for casual hikers. However, after dark, it is large enough for a small number of Garou to meet there. There is a water pump outside and a generator downstairs for a little heat and light, but with park visitors coming year-round, it's best to leave no trace of one's presence and be gone before daylight. As with the roving location of the assembly area, there is no specific place set aside for challenges. The Sept of Forgotten Questions is more primitive than many, and challenges are often settled swiftly, simply, and sometimes brutally. The 'where' does not matter as much as the 'how'. In between slabs of the sky-clawing Fountain Formations, not far from the area where the Garou gather, there is a place where the distinctive red of the sandstone darkens to almost black. Mostly hidden by spikes of the easily-eroded but surprisingly sharp rock is a deep crack, no more than a couple of feet long and a few inches wide at its largest point. The sunlight never reaches that precise spot, and it seems colder for several feet around. When the moon is new, and if one can climb and squirm and squeeze themselves between rocks just right, the darkness in the crack seems to go on forever. And if one can make themselves small enough, or if one is simply determined enough, and fearless enough to do so, one can reach their hand into the widest part of the cleft. It is like reaching into nothingness, into the cold emptiness of space. Without ever reaching deeper, one can wait -- sometimes for minutes, sometimes for days -- and feel one's hand going farther, and farther. One begins to feel the age of this place. The Garou can feel the earth's struggle to contain and resist the forces of other elementals: wind, water, and the burning, raging core of the very planet. They can feel their own struggle there, as it has gone on since creation: the need to nourish and protect the very things that stand to destroy you. As it is with Earth and those creatures that walk on it and those spirits who churn within it, so it is with the Garou and humanity, the Garou and the Triat. Reaching into the heart of the heart is a sacred honor reserved for Garou who have proven themselves to the nation and to the Sept of Forgotten Questions. Theurges below the rank of Adren and any other Garou beneath the rank of Athro who reaches into the caern without permission from both the Master of Rites and the Warder will be punished severely, with heavy losses of Honor and Wisdom. Any Garou, even one of appropriate rank, who touches the heart without good reason will likely still incur renown loss and be watched more carefully by the caern's Guardians -- both physical and spiritual. The Sept of Forgotten Questions reveres their dead in a way that many -- even among the Garou -- would find grisly, barbaric, and even disrespectful. Not far from the caern's heart there is a granite monolith which, in the Penumbra, glows faintly with a pale white light. If there are intact remains, the corpse is taken across the Gauntlet and, after a proper Gathering for the Departed, tied against or laid out below the monolith. There it remains for a number of days. The fallen Garou's packmates, or at least one or two representatives, are expected to wait in vigil while the body begins to decompose. Should the spirits of birds, vermin, or other creatures of Gaia come to take their share of the corpse, the Garou do not interfere. Should their pack be unable to bear the vigil, other Garou may take up the charge, but it is considered a dishonor to turn one's back on this duty. Very rapidly, often within a few days, any body roped to or lying before this monolith is nothing but bleached bone. At that point, the bones are ground to dust which is rubbed into the granite, sometimes cutting the palms of the participants and mixing bone, blood, and rock together. When battle or tribal rites of death leave no intact body with which to carry out this vigil, something dedicated to the deceased is burnt and its ash rubbed into the stone the same way that bone-dust would be otherwise. In this way, the dead become absorbed into the caern itself. No glyphs, no names are carved into the granite gravestone. But should one ever wish to visit their fallen brothers and sisters, one simply has to rest their palm against the rock. Like calls to like, and memories contained in the gravestone stir to the call of blood, tribe, pack, and other bonds, returning to the living.